Today, we are excited to announce the ability to enable backup on virtual machines from VM create experience in the portal. Last year, we also announced support for backing up virtual machines from VM management blade. With this announcement, we are bringing the ability to protect the VMs with an enterprise-grade backup solution from the moment of VM creation. 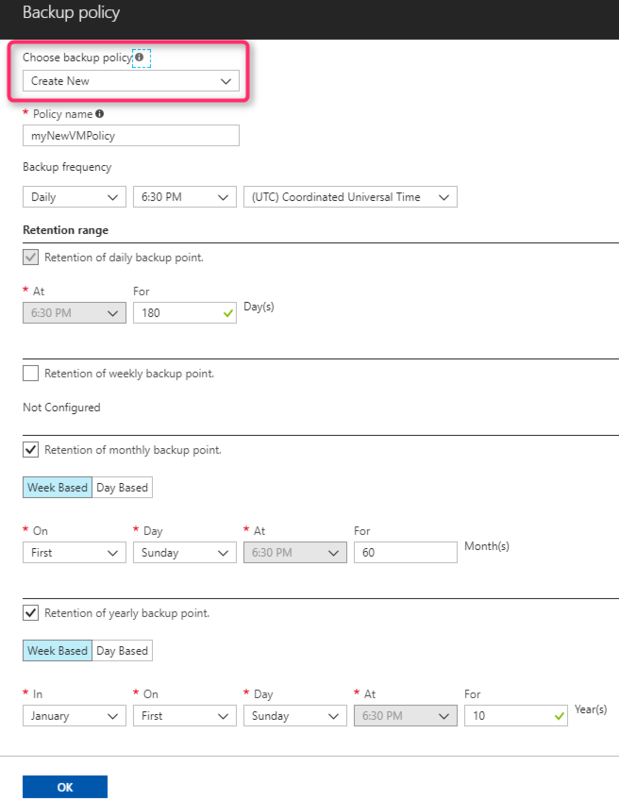 Azure Backup supports backup of wide variety of VMs offered by Azure including Windows or Linux, VMs on managed or unmanaged disks, premium or standard storage, encrypted or non-encrypted VMs, or a combination of the above. Setup backup in 1-click: With smart defaults provided with the experience, customers would be able to add backup to a VM with just one-click. Select or create a vault in-line: Customers have a choice for vault – select an existing one or create a new one to store backups. To support customer configurations where they want to store backups and VMs in different resource groups, we also support creating vault in a different resource group other than the VM. Manage backup policy for the VM: Customers can create a new backup policy and use this policy to configure backup on the virtual machine, all from the VM create experience. This policy also supports enterprise level GFS schema for flexible retention choices for backups. Freedom from infrastructure: No need to deploy any additional infrastructure to backup VMs. Application consistent backup: Customers get application consistent backup for both Windows and Linux without the need to shutdown the virtual machine. Instant-file recovery: With instant-file recovery, you can browse files and folders inside the VM, and recover only required files without the need to restore entire virtual machine. Pay as you go: Simple Backup pricing makes it easy to protect VMs and pay for what you use. This experience is enabled for all OS images supported by Azure Backup. 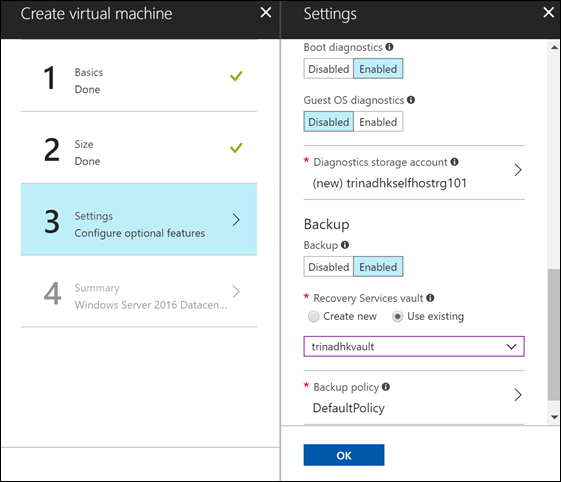 You will see the option to enable backup in the 3rd step of the VM create experience. By default, this experience is turned off and you can enable it by toggling the choice. We are enabling this experience starting today and rolling it out region by region. You will see this across all regions by the end of this week.